Buckwheat pillows have grown in popularity with the evolution of the Green Movement. This all-natural plant material has been a mainstay in the Asian sleep industry for centuries. Some retailers like to market is as an “Asian secret.” Buckwheat pillows can be cheap or pricey, and made of low- or high-quality materials. Buckwheat is a crop plant grown in Asia and North America, but has been used widely in Asian foods as an affordable grain and turned into cheap flour for noodles and other products. The buckwheat seed has a tough, but thin hard shell. It’s this shell or hull that’s used as an alternative filling in pillows and other upholstered products. The hulls used in this manner are valued for their durability and therapeutic uses. Can be mixed with aromatic herbs like lavender and chamomile for a complete sleep experience. Alternative and eco-friendly materials that use disposable by-products. A few years ago flash-in-the-pan marketers hawked “Japanese” buckwheat pillows and largely inundated the market with low-quality pillows that lasted only a few months. For this reason you should take measures to do your homework before you buy. Not all experts agree that buckwheat is as therapeutic as is advertised, so do your research. Make sure you explore the source for buckwheat hulls—if possible exactly where the hulls are milled and how. You want organic, dust-free, thoroughly cleaned hulls. Find out if the milling process ensures the hulls are free from mold spores. 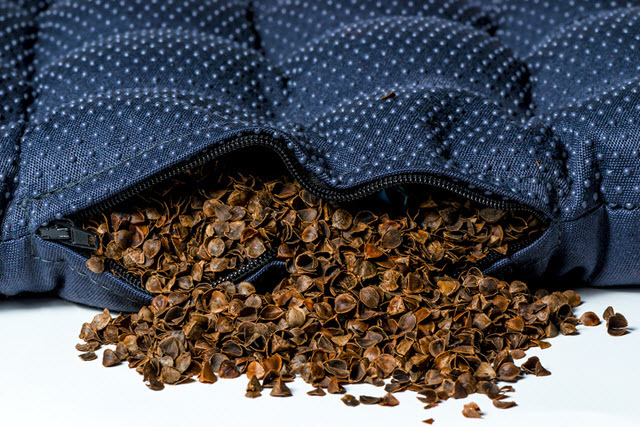 Remember, because buckwheat hulls are a natural plant by-product the chances for corruption due to allergens, mold spores, dust, mites and more should put you on the search for the best quality available. A high-quality buckwheat pillow will usually come with an expense. Many are hand-made in small cottage-type businesses. Pillow covers are usually cotton, some unbleached, and muslin.